Bruce did not fall to his death off a 50 story high ladder, thank God. Those of you who have met my intrepid husband will be proud of the "old geezer". He spent 7 days backpacking the West Coast Trail. 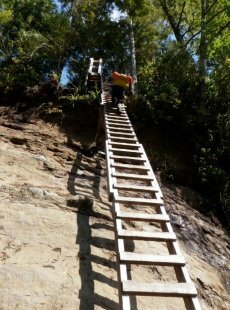 Famed for being one of the "ten best hikes in the world", it is fraught with over 100 ladders, many hand pulled gondolas and severe hiking conditions. He and his friend were by far - the oldest guys on the trail. He is such a proud supporter of my quilting, that I feel compelled to tell you how equally proud I am of him. (Just wish he could leave behind the testosterone driven, death defying part). Strange flooding, hot, hot weather across much of the country. The N.W. has been cold. My heart goes out to all the victims of the floods and wildfires. I hope you and your families have not been impacted. This is the first summer I have ever taken off with no teaching trips. It has been great to play with the grands, go on family trips and finish writing my new book! Many of you have heard that AQS will no longer be publishing books. Those of us who had proposals accepted, even signed contracts, were shocked and surprised. I still really want to share it with you; figuring out how to do so has taken me on some new creative adventures. 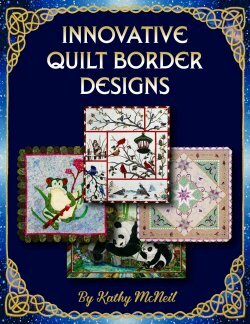 Innovative Quilt Border Designs - is available now! Let’s add some Razzle Dazzle to your finish line. Innovative borders add an extra layer of excitement and discovery to enhance the visual impact of your quilt. Use them to enrich your color scheme, dramatize a theme, bring unity, balance, or create movement. Learn helpful principles of design as they apply to borders. Kathy shares tips for choosing complimentary, innovative designs, construction of various options, and quilting your borders. This book includes over 70 colorful images from many award winning quilters to inspire you. A big thank you to so many other quilters who shared their design thoughts and great borders in this book. One of my favorite parts of quilting is planning visually interesting and fun borders. Download your $10.99 digital copy - Receive an email link. No Shipping fees. Great for Canadian friends. Purchase your $15.99 paper back copy- We will ship it to you. You have to pick yourself back up and scour the depths of your being when hurtful rejections or remarks come your way. It has happened to all of us. One of my favorites - " you could buy that for $25.00 bucks". Why do we spend so much time, money and energy? Creativity makes our lives richer, more exciting, brings healtly benefits and lots of new friends and adventures. Quilt Art is subjective. There are so many diverse, awesome, incredible quilts these days that acceptance is always a surprise and honor. What happened that year; did the jury have 4 horse quilts entered in that category, did they think my horses were out of scale? Who knows? The only thing I do know is; that I make quilts because I am incredibly curious about the outcome, passionate about the possibilities I see in fabrics and, 80% of the time, I have a huge smile on my face at the end of a quilting day. This year I got lucky. But then I count my blessings every day. My life took a big turn down the road of unexpected joys and crazy adventures when I became a quilter. I am also really lucky to be teaching in Raleigh N.C. and Florida this fall. New friends and a great way to see and experience this diverse great county. We are planning a photography run to Merritt Island Wild life sanctuary in Florida to look for Roseate Spoonbills. I saw them for the first time on a teaching trip to S.C. I am fascinated by them and in love with their colors. A quilt is flickering in my brain but we need some photos. Lynn Way made this beautiful rendition of the Cardinal block from Audubon's Christmas pattern. Hi Kathy. "I don't know if you remember me from the Wichita workshop in February this year. I live in Vermont but was spending the winter near our daughter in Kansas. I sat in the front and you loaned me your Appliquick tools, instantly getting me hooked on the method, and I was so glad I bought them. 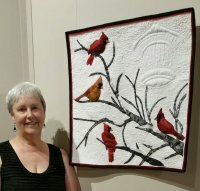 At that time I mentioned that I hoped to finish and enter my quilt at the Billings Farm Museum annual quilt exhibition. I will be displaying it there, starting in August and going until September. My blurb for the exhibit says that I took your class and adapted the pattern for Audubon Christmas. My design shows the birds on bare branches to look more like the maple trees in my yard, and instead of applique, the bird feeder is quilted, somewhat like your quilted birdhouse in the chickadee block. I used sparkle thread for that, and added clear beads for the seed. I wanted it to be more of a winter hanging than Christmas". Great job Lynn and thank you for sharing it with all of us!! I love following my workshops up with pictures. I'm happy to answer questions by e mail too. My brand new quilt "Best of the N.W." needs borders! 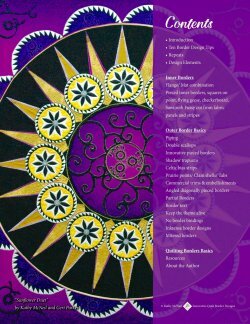 Watch this free video for designing, construction, and securing my border and piping to the quilt top. Click below. Let's get together -Workshop signups available in my Road to California classes and Kathy Dunnigan's Appliqué Academy classes. Let's get together! Have a fantastic finish to your summer. Click below to get back to the web site.